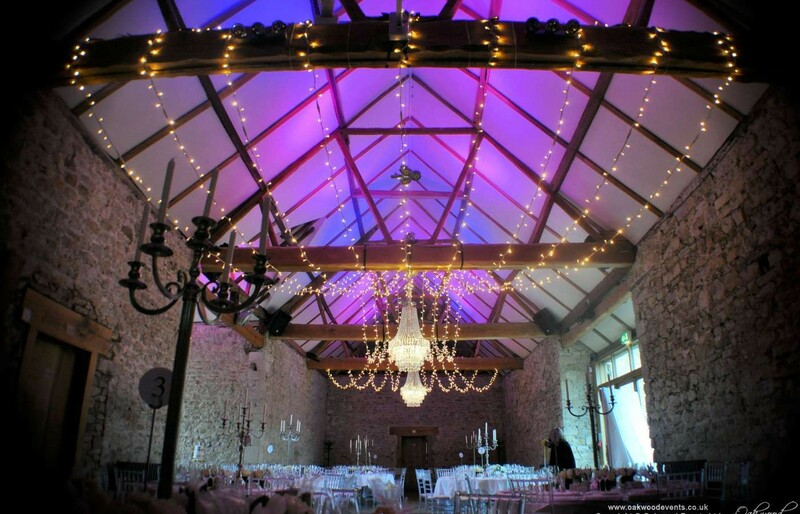 Our crystal chandeliers looked amazing at the centre of a large double-gathered canopy of fairy lights in the Monks’ Refectory barn at Notley Abbey. At one end of the barn is a stunning, 12th century stone wall onto which we projected a large custom monogram of the bride and groom’s names. Another popular option is to add outdoor fairy lights along the wooden walkway that leads between the barn and the main house. Take a look at our main Notley Abbey lighting page for more photos and ideas for your special day at Notley! 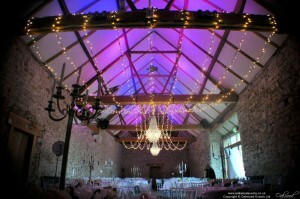 Just to say thank you so much for our star shaped fairy light canopy at our wedding reception. It really did make the room look magical, especially with the ivory chandelier and it created the atmosphere that I was hoping for all along. I don't think the venue would have looked even half as good without your services. Not only that, I would like to thank you for your professionalism throughout it all. You were so friendly and organised from start to finish. With so many other things to consider it was a great reassurance that you had it all in hand. We wouldn't hesitate to use you again in the future and recommend you to others.